Do you have tarnished silver that needs to be cleaned? If so, bring back the shine to your beloved silver with a product designed specifically for the task at hand. Oneida features several products that can remove years of tarnish as well as keep your silver looking great. As a member of LoveToKnow's writing and editorial team, I was sent several Oneida cleaning products to test and review. Find out more about these products in this informative independent review! Oneida, best known for its stainless, silver plated and sterling silver products, makes a line of cleaning products designed to remove tarnish and restore shine to silver pieces. Whether it is flatware or accent pieces for your home, silver is prone to tarnish which can make an item look less than desirable. To keep your items looking shiny and lustrous, cleaning is a must. This task requires products designed specifically for silver. I sampled four of the company's silver cleaning products on my personal silver items. The results are detailed below. 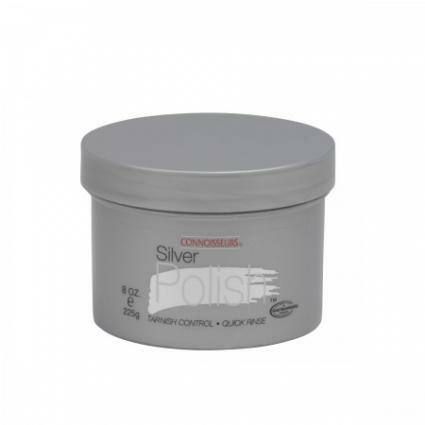 Connoisseurs Silver Polish Paste comes in a convenient eight ounce jar and is priced at $12. This product is designed to remove heavy tarnish and restore items to a high luster. To use the paste, apply with the applicator enclosed in the jar or use a damp sponge or cloth. A little polish goes a long way so start out with a little on the applicator and add more as needed. Polish the item then rinse with warm water and buff to a shine. I used this paste on candle holders that were heavily tarnished. I did not have to use a lot of this product to get outstanding results. I was surprised at how quickly the shine came back to my candle holders and would use this product again and again. The Silver Polishing Cloth is actually two clothes in one convenient item. The light blue inner cloth cleans with exclusive cleaning agents contained in the cloth that apply a barrier to the piece you are cleaning. The outer grey cloth polishes and buffs pieces to create a high luster. Oneida recommends using the cloth for sterling silver and silver plated items. The cloth is used by rubbing each item with the inner cloth until tarnish is removed. After there is no visible tarnish, use the outer cloth to polish the item to a high luster shine. I like this cloth because it can clean, polish and protect silver pieces. I used it on several items and noticed that my silver stayed tarnish free for a longer amount of time and that it was a quick way to quickly shine an item without any mess. The Silver Polishing Mitts are used to clean sterling, silver plate and gold plate items. The mitts are a unique and convenient way to polish pieces and keep them tarnish-free. I found them to be a great way to touch up pieces that have intricate details such as the handles on silver flatware or a decorative piece that has a lot of design and grooves. The mitts fit over your hands and are mess free and contain no odor. They are also great to use when handling shiny pieces without leaving your fingerprints on the item. To use, simply put on the mitts and rub the item until there is no tarnish or dirt. Oneida recommends refreshing the mitts after several uses by gently washing then allowing them to air dry. Apply a silver polish spray to restore the anti tarnish cleaning properties. Silver Wipes include ten in a box. These disposable wipes are priced at $12. To use, wet silver item with water then polish with silver wipe. Rinse item with water and towel dry. The wipes are a no-mess, no-fuss product that are formulated with a silver cleaner that is odorless. They leave items with an anti-tarnish coating and shine. They are perfect to use when an item is pulled out of a drawer and you discover minimal tarnish on it. If you are expecting guests and are in a hurry, this product is for you. I used it on a pair of silver earrings that I wanted to wear but noticed they were slightly tarnished. After a few quick wipes, my earrings looked like new and I was out the door. I plan on keeping these wipes in my jewelry drawer as well as in my flatware drawer since they can be pulled out quickly to shine an item and then tossed away. If you are interested in trying a cleaning product from Oneida, there are several options to consider. The products can be found at retailers that specialize in silver, stores such as Target as well as online at sites like Oneida.com and Amazon.com. LoveToKnow would like to thank Oneida for providing the various silver cleaning products for this review.